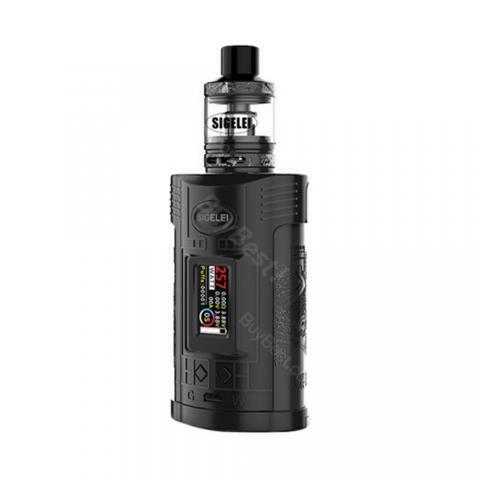 Sigelei GW Kit is a one compatible with dual 21700/20700/18650 batteries, featuring a maximum 257w power output. The 1 inch color screen Sigelei GW comes with displays nicely to navigate vaper the operation. The GW kit by Sigelei is a new compact dual-battery outputs a max 257w power. The mod itself is compatible with multiple types of batteries like 21700, 20700, 18650. Like many other hyper mods, Sigelei GW has power modes, TC modes and TCR modes to play with. The 1 inch TFT color screen makes it easier to navigate the whole operation menu. The F tank is loaded with 0.2 ohm single coil with the 4.5ml e-juice capacity to deliver a nice and smooth vaping feeling. • NO batteries included. You shall select 21700/20700(IJOY)/20700(Ampking)/18650 cells. • Empty tank. You can buy e-juice separately. The 257W Sigelei GW TC Starter Kit is easy to use and clean. The design is so cool and the Sigelei GW TC works well. This is the best-looking Vape I ever seen! Chinese Engravings and The Big Wall of China proverb. Can't wait to get mine! Good product with good price! Sigelei GW TC kit looks nice. I bought it for my boyfriend, and he likes the kit.